People with Preview installed can view movie trailers on Google Glass just by looking at a poster. Well, that and speaking the words "OK Glass, preview." The app will then search YouTube for the most recent promotional video. If you want to get your hands on the APK, it's available for download here, and it's also up on the usual channels. Just be sure to have an answer ready when someone comes up to you wondering why you've been staring at a poster for so long. And if you're watching the trailer for a comedy, after enough laughs, they're probably going to think you're crazy. Then again, you're a Glass owner, so you're probably already used to the attention. 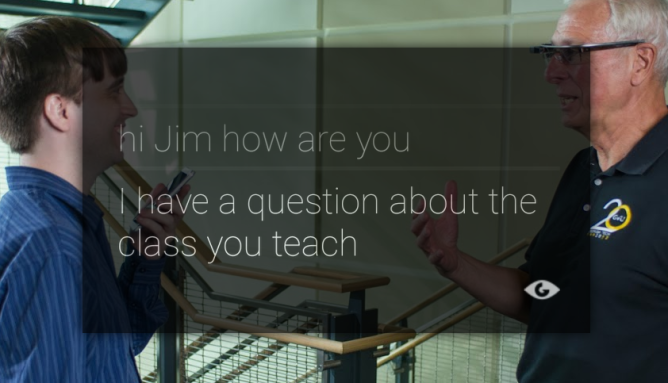 Another bit of functionality that came to mind when dreaming of Google Glass was the ability to read what people say, a feature that can be immensely useful for people who cannot or struggle to hear. Captioning on Glass transcribes text in real-time. It requires a companion app to run on a traditional Android device. When wearers say "OK Glass, recognize this," they can then read every word their conversation partner speaks into the phone. Even if Glass remains a niche tool in the future, these apps help to flesh out its purpose and assist the device in delivering on its promise. Plus, they're just plain cool.